When Should Someone Seek Medical Care for Asthma? How Do Health-Care Professionals Diagnose Asthma? What Are Treatment Options for Asthma? What Is the Emergency Medical Treatment for Asthma? What Is the Prognosis of Asthma? Asthma is a disease that affects the breathing passages of the lungs (bronchioles). Asthma is caused by chronic (ongoing, long-term) inflammation of these passages. This makes the breathing tubes, or airways, of the person with asthma highly sensitive to various "triggers." When the inflammation is "triggered" by any number of external and internal factors, the walls of the passages swell, and the openings fill with mucus. This resistance to exhaling leads to the typical symptoms of an asthma attack. What are other asthma causes? Because asthma causes resistance, or obstruction, to exhaled air, it is called an obstructive lung disease. The medical term for such lung conditions is chronic obstructive pulmonary disease or COPD. COPD is actually a group of diseases that includes not only asthma but also chronic bronchitis and emphysema. Some people with asthma do not have COPD. These are the individuals whose lung function returns to normal when they are not having an attack. Others will have a process of lung airway remodeling from chronic, long-standing inflammation, usually untreated. This results in permanent abnormalities of their lung function with symptoms of obstructive lung disease occurring all the time. These people are categorized as having one of the class of diseases known as COPD. Can you get rid of asthma? You have a better chance of controlling your asthma if it is diagnosed early and treatment is begun right away. Without treatment, they will have more frequent and more severe asthma attacks and can even die. Ongoing persistent airway inflammation can lead to progressive deterioration of lung function and can result in disability and even death. Asthma is on the rise in the United States and other developed countries. We are not sure exactly why this is, but these factors may contribute. Our lifestyle has led to our getting less exercise and an epidemic of obesity. There is some evidence to suggest an association between obesity and asthma. Asthma is a very common disease in the United States, where more than 17 million people are affected. A third of these are children. Asthma affects all races and is slightly more common in African Americans than in other races. Asthma is the most common chronic disease of children. Asthma has many costs to society as well as to the individual affected. Asthma costs the U.S. economy nearly $13 billion each year. Approximately 5,000 people die of asthma each year in the U.S. These numbers may not take into account those individuals who have developed severe COPD from inadequately treated asthma. The good news for people with asthma is that you can live your life to the fullest. Current treatments for asthma, if followed closely, allow most people with asthma to limit the number of attacks they have. With the help of your health-care provider, you can take control of your care and your life. The exact cause of asthma is not known. The environment you live in and the way you live partly determine whether you have asthma attacks. An asthma attack is a reaction to a trigger. It is similar in many ways to an allergic reaction. It is this series of reactions that results in inflammation of the lining of the air passages. This can result in a modification of the cell types lining these airways. More glandular-type cells develop, which can cause the production of mucus. This mucus, along with irritation to muscle receptors in the airways, can cause bronchospasm. These responses cause the symptoms of an asthma attack. In asthma, the "invaders" are the triggers listed below. Triggers vary among individuals. Because asthma is a type of allergic reaction, it is sometimes called reactive airway disease. genetic predisposition (a parent, brother, or sister also has asthma). Mild intermittent: This includes attacks no more than twice a week and nighttime attacks no more than twice a month. Attacks last no more than a few hours to days. Severity of attacks varies, but there are no symptoms between attacks. Mild persistent: This includes attacks more than twice a week, but not every day, and nighttime symptoms more than twice a month. Attacks are sometimes severe enough to interrupt regular activities. Moderate persistent: This includes daily attacks and nighttime symptoms more than once a week. More severe attacks occur at least twice a week and may last for days. Attacks require daily use of quick-relief (rescue) medication and changes in daily activities. Severe persistent: This includes frequent severe attacks, continual daytime symptoms, and frequent nighttime symptoms. Symptoms require limits on daily activities. recurrent, spasmodic cough that is worse at night. If you or your child has asthma, you should have an action plan worked out in advance with your health-care provider. This plan should include instructions on what to do when an asthma attack occurs, when to call the health-care provider, and when to go to a hospital emergency department. The following are general guidelines only. If your provider recommends another plan for you, follow that plan. Take two puffs of an inhaled beta-agonist (a rescue medication), with one minute between puffs. If there is no relief, take an additional puff of inhaled beta-agonist every five minutes. If there is no response after eight puffs, which is 40 minutes, your health-care provider should be called. Your provider also should be called if you have an asthma attack when you are already taking oral or inhaled steroids or if your inhaler treatments are not lasting four hours. Although asthma is a reversible disease, and treatments are available, people can die from a severe asthma attack. If you are having an asthma attack and have severe shortness of breath or are unable to reach your health-care provider in a short period of time, you must go to the nearest hospital emergency department. the extent to which the attack is interfering with regular activities. "silent" chest (no wheezing on inhalation or exhalation). If you are able to speak, the health-care provider will ask you questions about your symptoms, your medical history, and your medications. Answer as completely as you can. He or she will also examine you and observe you as you breathe. If this is your first attack, or the first time you have sought medical attention for your symptoms, the health-care provider will ask questions and perform tests to search for and rule out other causes of the symptoms. Spirometer: This device measures how much air you can exhale and how forcefully you can breathe out. The test may be done before and after you take inhaled medication. Spirometry is a good way to monitor your lung function, but this forced maneuver during an attack can worsen your symptoms. This test is a more accurate measurement of your baseline lung function. Peak flow meter: This is another way of measuring how forcefully you can breathe out during an attack. This is a useful tool for monitoring the severity of an attack as well as the adequacy of maintenance therapy. It is a less forceful maneuver and therefore can be used during an attack. Controller/maintenance medications: These are for long-term control of persistent asthma. They help to reduce the inflammation in the lungs that underlies asthma attacks. You take these every day regardless of whether you are having symptoms or not. Rescue medications: These are for short-term control of asthma attacks. You take these only when you are having symptoms or are more likely to have an attack -- for example, when you have an infection in your respiratory tract. Some feel that the term rescue medication means that you only use it in an emergency. Actually, these medications should be used for any asthma symptoms, like cough, wheezing, chest tightness, or shortness of breath. They can also be used in anticipation of an activity that causes shortness of breath. It is important to keep track of the frequency that these inhalers are used for unplanned symptoms (that is, not when used in anticipation of symptoms for an activity). Asthma is considered well-controlled when rescue therapy is used less than five times per week. If asthma is not well controlled, then your provider can add additional medications. This concept is important because it helps in overall control and patient understanding of their asthma management. As is described below, medication can be added (step-up therapy) when rescue inhaler use increases for a period of time. Similarly, medications can be reduced (step-down therapy) when rescue use is minimum or nonexistent. 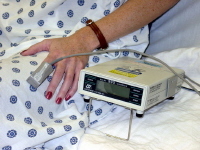 use of a peak flow meter. At your follow-up visits, your health-care provider will review how you have been doing. He or she will ask you about frequency and severity of attacks, use of rescue medications, and peak flow measurements. Lung function tests may be done to see how your lungs are responding to your treatment. This is a good time to discuss medication side effects or any problems you are having with your treatment. The peak flow meter is a simple, inexpensive device that measures how forcefully you are able to exhale. Ask your health-care provider or an assistant to show you how to use the peak flow meter. He or she should watch you use it until you can do it correctly. Keep one in your home and use it regularly. Your health-care provider will make suggestions as to when you should measure your peak flow. Checking your peak flow is a good way to help you and your health-care provider assess what triggers your asthma and its severity. Check your peak flow regularly and keep a record of the results. Over time, your health-care provider may be able to use this record to determine appropriate medications, reducing dose or side effects. Peak flow measures fall just before an asthma attack. If you use your peak flow meter regularly, you may be able to predict when you are going to have an attack. It can also be used to check your response to rescue medications. when to go directly to the hospital emergency department. Since asthma is a chronic disease, treatment goes on for a very long time. Some people have to stay on treatment for the rest of their lives. The best way to improve your condition and live your life on your terms is to learn all you can about your asthma and what you can do to make it better. Become a partner with your health-care provider and his or her support staff. Use the resources they can offer -- information, education, and expertise -- to help yourself. Become aware of your asthma triggers and do what you can to avoid them. Follow the treatment recommendations of your health-care provider. Understand your treatment. Know what each drug does and how it is used. See your health-care provider as scheduled. Report any changes or worsening of your symptoms promptly. Report any side effects you are having with your medications. have as few side effects of medication as possible. Current treatment regimens are designed to minimize discomfort, inconvenience, and the extent to which you have to limit your activities. If you follow your treatment plan closely, you should be able to avoid or reduce your visits to your health-care provider or the emergency department. Know your triggers and do what you can to avoid them. Do not take cough medicine. These medicines do not help asthma and may cause unwanted side effects. Aspirin and nonsteroidal anti-inflammatory drugs, such as ibuprofen, can cause asthma to worsen in certain individuals. These medications should not be taken without the advice of your health-care provider. Do not use nonprescription inhalers. These contain very short-acting drugs that may not last long enough to relieve an asthma attack and may cause unwanted side effects. Take only the medications your health-care provider has prescribed for your asthma. Take them as directed. Do not take any nonprescription preparations, herbs, or dietary supplements, even if they are completely "natural," without talking to your health-care provider first. Some of these may have unwanted side effects or interfere with your medications. If the medication is not working, do not take more than you have been directed to take. Overusing asthma medications can be dangerous. Be prepared to go on to the next step of your action plan if necessary. If you think your medication is not working, let your health-care provider know right away. If you are in the emergency room, treatment will be started while the evaluation is still going on. 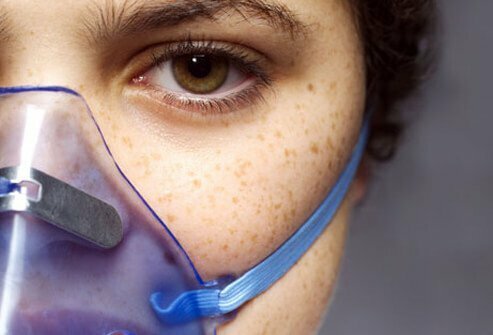 You may be given oxygen through a face mask or a tube that goes in your nose. You may be given aerosolized beta-agonist medications through a face mask or a nebulizer, with or without an anticholinergic agent. Another method of providing inhaled beta-agonists is by using a metered dose inhaler or MDI. An MDI delivers a standard dose of medication per puff. MDIs are often used along with a "spacer" or holding chamber. A dose of six to eight puffs is sprayed into the spacer, which is then inhaled. The advantage of an MDI with a spacer is that it requires little or no assistance from the respiratory therapist. If you are already on steroid medications, or have recently stopped taking steroid medications, or if this appears to be a very severe attack, you may be given a dose of IV steroids. If you are taking a methylxanthine, such as theophylline or aminophylline, the blood level of this drug will be checked, and you may be given this medication through an IV. People who respond poorly to inhaled beta-agonists may be given an injection or IV dose of a beta-agonist such as terbutaline or epinephrine. You will be observed for at least several hours while your test results are obtained and evaluated. You will be monitored for signs of improvement or worsening. If you respond well to treatment, you will probably be released from the hospital. Be on the lookout over the next several hours for a return of symptoms. If symptoms should return or worsen, return to the emergency department right away. Your response will likely be monitored by a peak flow meter. other serious lung illnesses or injuries, such as pneumonia or pneumothorax (a "collapsed" lung). Controller medicines help minimize the inflammation that causes an acute asthma attack. Long-acting beta-agonists (LABA): This class of drugs is chemically related to adrenaline, a hormone produced by the adrenal glands. Inhaled long-acting beta-agonists work to keep breathing passages open for 12 hours or longer. They relax the muscles of the breathing passages, dilating the passages and decreasing the resistance to exhaled airflow, making it easier to breathe. They may also help to reduce inflammation, but they have no effect on the underlying cause of the asthma attack. Side effects include rapid heartbeat and shakiness. Salmeterol (Serevent), formoterol (Foradil), indacaterol (Arcapta), and vilanterol (used in Breo and Anoro) are long-acting beta-agonists. These drugs should not be used alone in patients with asthma. There is a box warning based on the SMART trial with salmeterol in which there was an increased risk of cardiac death in asthmatics. This issue appears to be mitigated when these drugs are used in combination with inhaled steroids. Inhaled corticosteroids are the main class of medications in this group. The inhaled steroids act locally by concentrating their effects directly within the breathing passages, with very few side effects outside of the lungs. Beclomethasone (Beclovent), fluticasone (Flovent, Arnuity), budesonide (Pulmicort), and triamcinolone (Azmacort) are examples of inhaled corticosteroids. Combination therapy with both a LABA and an inhaled corticosteroid: These include Advair (salmeterol, fluticasone), Symbicort (formoterol, budesonide), and Dulera (formoterol, mometasone), and are all taken twice daily. Newer agents like Breo are combination therapies that only need to be taken once daily. Leukotriene inhibitors are another group of controller medications. Leukotrienes are powerful chemical substances that promote the inflammatory response seen during an acute asthma attack. By blocking these chemicals, leukotriene inhibitors reduce inflammation. The leukotriene inhibitors are considered a second line of defense against asthma and usually are used for asthma that is not severe enough to require oral corticosteroids. Zileuton (Zyflo), zafirlukast (Accolate), and montelukast (Singulair) are examples of leukotriene inhibitors. Methylxanthines are another group of controller medications useful in the treatment of asthma. This group of medications is chemically related to caffeine. Methylxanthines work as long-acting bronchodilators. At one time, methylxanthines were commonly used to treat asthma. Today, because of significant caffeine-like side effects, they are being used less frequently in the routine management of asthma. Theophylline and aminophylline are examples of methylxanthine medications. Cromolyn sodium is another medication that can prevent the release of chemicals that cause asthma-related inflammation. This drug is especially useful for people who develop asthma attacks in response to certain types of allergic exposures. When taken regularly prior to an exposure, cromolyn sodium can prevent the development of an asthma attack. However, this medicine is of no use once an asthma attack has begun. Omalizumab belongs to a newer class of agents that works with the body's immune system. In people with asthma who have an elevated level of Immunoglobulin E (Ig E), an allergy antibody, this drug given by injection may be helpful with symptoms that are more difficult to control. This agent inhibits IgE binding to cells that release chemicals that worsen asthma symptoms. This binding prevents release of these mediators, thereby helping in controlling the disease. Rescue medications are taken after an asthma attack has already begun. These do not take the place of controller drugs. Do not stop taking your controller drug(s) during an asthma attack. Short-acting beta-agonists (SABA) are the most commonly used rescue medications. Inhaled short-acting beta-agonists work rapidly, within minutes, to open the breathing passages, and the effects usually last four hours. Albuterol (Proventil, Ventolin) is the most frequently used SABA medication. Anticholinergics are another class of drugs useful as rescue medications during asthma attacks. Inhaled anticholinergic drugs open the breathing passages, similar to the action of the beta-agonists. Inhaled anticholinergics take slightly longer than beta-agonists to achieve their effect, but they last longer than the beta-agonists. An anticholinergic drug is often used together with a beta-agonist drug to produce a greater effect than either drug can achieve by itself. Ipratropium bromide (Atrovent) is the inhaled anticholinergic drug currently used as a rescue asthma medication. If you have been treated in a hospital emergency department, you will be discharged once you respond well to the treatment. You may be asked to see your primary-care provider or an asthma specialist (allergist or pulmonologist) in the next day or two. If your symptoms return, or if you begin to feel worse, you should immediately contact your health-care provider or return to the emergency department. Asthma is a long-term disease, but it can be managed. Your active involvement in treating this disease is vitally important. Take your prescribed medications as directed, both controller and rescue medications. See your health-care provider regularly according to the recommended schedule. By following these steps, you can help minimize the frequency and severity of your asthma attacks. Asthma is now treated in a step-wise approach. Intermittent asthma is treated with a rescue inhaler which is only used for symptoms. Persistent asthma requires the use of maintenance medication, usually initially an inhaled steroid, but other medications such as leukotriene inhibitors are also used. The more severe the asthmatic condition, the more maintenance medications are required, and therapy is "stepped up." These additional medications include the long-acting beta agonists, oral steroids, and in some cases, theophyllines or omalizumab. As asthma improves, decreasing the amount of medication (under a physician's guidance) and in some cases, stopping some of the medication may be indicated. This is referred to as "stepping down" therapy. Most people with asthma are able to control their condition if they work together with a health-care provider and follow their treatment regimen carefully. People who do not seek medical care or do not follow an appropriate treatment plan are likely to experience worsening of their asthma and deterioration in their ability to function normally. A child with asthma uses a metered-dose inhaler. An adult with asthma uses a spirometer to measure how forcefully she can exhale. A pulse oximeter measures the amount of oxygen in your bloodstream. 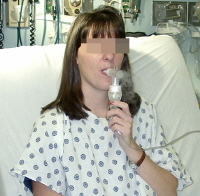 A person with asthma receives an inhalation treatment using a handheld nebulizer. 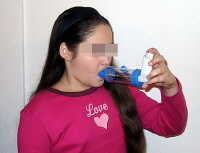 A child with asthma uses a metered-dose inhaler with a spacer. The main goals in the medical treatment of asthma are to prevent asthma attacks and to control the disease. Avoiding triggers that induce or aggravate asthma attacks is an important aspect of prevention. Fanta, C. "Asthma." NEJM 360 (2009): 1002-1014. Javeed Akhter, M.D. Can asthma be cured? What are the latest treatments? 2018. 21 November 2018 . What kinds of treatments have been effective for your asthma? Please describe your asthma diagnosis. What are your asthma symptoms? What happens during your asthma attacks?